Total of 70 is up a bit on last year, getting back to the low pre-baby levels. It was a bit easier to read with him from 1 to 2 since he can play on his own a bit. Suspect that might get harder now he needs more entertainment. 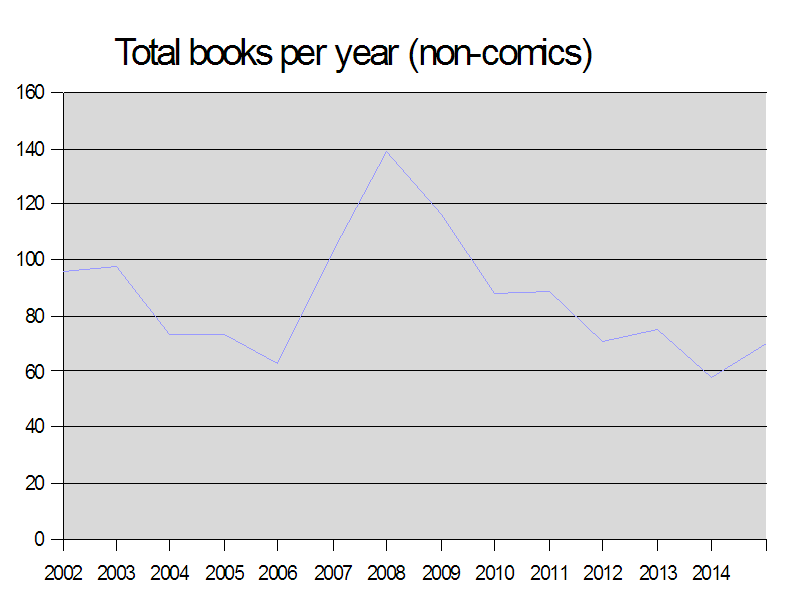 I seem to be reading a bit more science fiction again, the line has zagged back up after declining for a while. I think that might be because it's easier to get through long series on an e-reader without having to handle paper. Both non-fiction highlights are depressing but important. "Capital in the Twenty-First Century" by Thomas Piketty lives up to its reputation, amassing solid detail on the rise of inequality since the Seventies. "The Muslims are Coming!" by Arun Kundnani isn't quite as solid, with a couple of unconvincing arguments in there, but overall a chilling description of how flimsy is the evidence base for official strategy against Islamic terrorism. Non-fiction lowlight was "The Last Panther", which fooled me for about halfway, but appears to be a hoax. Science fiction highlights were the light but fun old-school novels "The Roboteer" by Alex Lamb and "The Martian" by Andy Weir. Regular fiction highlight was the intense "Barracuda" by Christos Tsiolkas. That's it. See you next year! 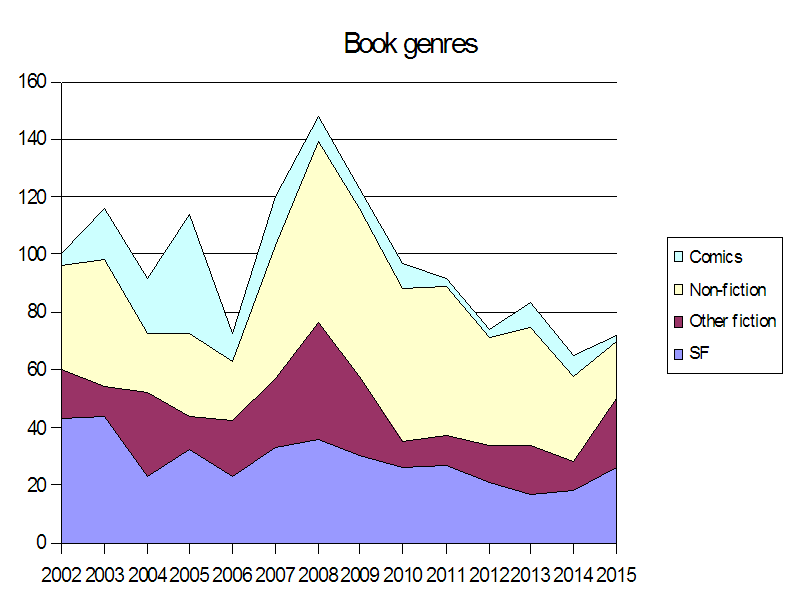 Increase in Science Fiction / Fantasy? - The Muslims are Coming! My dad was reading that on his Kindle when he passed. I bought it (paperback version) from the Amazon - might read it over Christmas break.